Not all content is destined to go viral. In fact, most good content is not going to get a whole lot of traction virally. When was the last time you saw a Wikipedia page trending on social media? It’s easy to promote a fun click-baity piece, a funny video, or a timely research report by simply saying ‘this is new and fun, check it out and share if you like it’. Authoritative content that’s closer to Wikipedia and far from Buzzfeed, not so easy. You could, on one hand, try and publish it and hope that people stumble upon it. Or you can get creative about how you promote it. Hopefully, these tips can help you get more eyeballs on your less-than-exciting content. Suppose you’re producing an in-depth guide. It’s only natural that you would want to include views of experts to add credibility, give multiple points of views, and make the piece more interesting. Why not pick experts that are also looking for links? 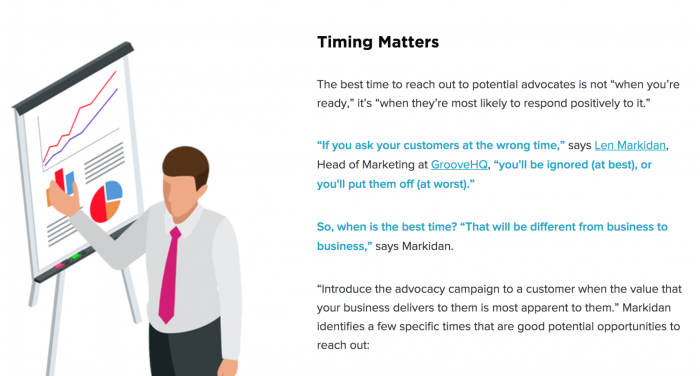 One example of this is the Customer Advocacy Playbook – a 9,000-word guide produced by marketing agency Web Profits. The guide includes views from at least a dozen industry experts, such as the one seen below. Make sure that ahead of time, you check out the expert’s website and find an article the expert produced that would naturally link out to your resource. After spending all this time producing your masterpiece, perhaps it will make a great case study on how to create X type of content. Take LawnStarter – the on-demand lawn mowing startup that’s known for creative marketing. 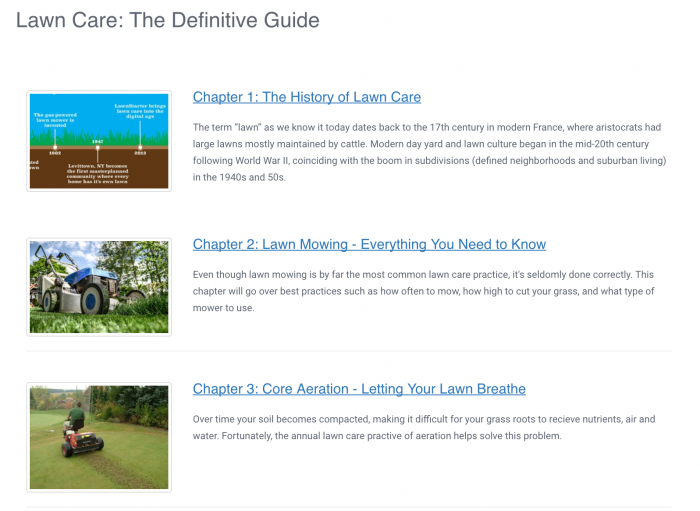 Like many companies, they produced a foundational, ‘definitive’ six chapter guide to the lawn care industry which when read, positions the company as a thought leader. But who is going to share or link to a piece about mowing grass? As it turns out, they received mentions from sites like CopyBlogger and Entrepreneur describing how the piece was a great example of evergreen content. If you try and hit up Rand Fishkin or Sujan Patel to share or link to your content just because you mentioned him, good luck. These types of influencers emailed so frequently they probably delete the emails so fast your head would spin. But perhaps there are people that aren’t so used to being pandered to. Think college presidents, mayors, or other boring industry thought leaders that aren’t used to getting cold emails 10 times per week. 2) That you position them in a very positive way in your piece. Being a journalist in the internet age is not easy. They need to crank out content faster than ever to keep up with internet speeds while maintaining journalistic standards from the print age. Suppose a journalist is working on a piece with a tight deadline and is about to spend the day searching the bowels of the internet for resources on the topic. But suddenly, and authoritative, well-researched resource for that piece appears in their inbox. They’re going to feel like they hit the jackpot. But how do you make sure your piece hits their inbox at the right time? 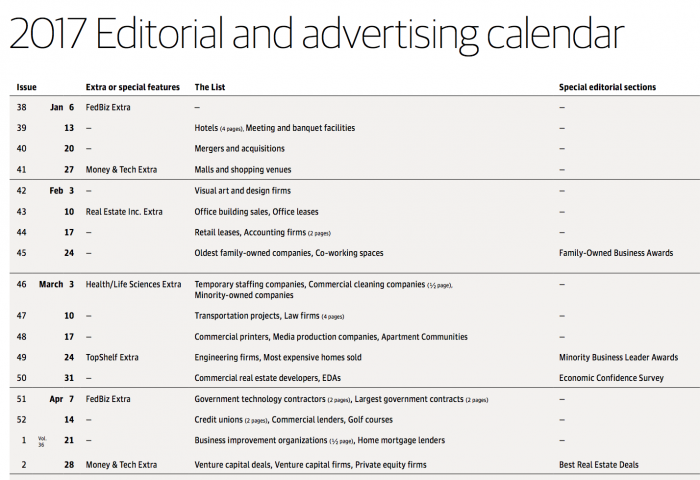 For starters, many publications have editorial calendars, so you can line up your content with what that publication is scheduled to write about. Here’s an example from the Washington Business Journal. Better yet, find the journalists whose beat is aligned with your niche, and start a relationship early. Give before you get, and that journalist just may hit you up when they need an expert opinion. And as that expert, you can point to half a dozen resources you’ve produced that will practically write their story for them. This will result in a nice, juicy editorial link for you. Now you know that you can’t expect to promote your foundational content the same way you’d promote a fun piece or a trendy piece. The great thing about foundational content is that it pays dividends for a long time. Plus, you don’t have to stop promoting it. Start with one tactic, use it until you can’t squeeze any more juice out of it, then move onto the next. If done right, that content will continue to generate traffic, establish trust and hopefully convert into paying customers for years to come.